The NAWLA John J. Mulrooney Memorial Award is the industry’s highest honor. It was created in 1979 as a testimony to the life and career of John J. Mulrooney, who was the North American Wholesale Lumber Association’s Chief Staff Executive from 1960 to 1979. Awarded annually, it recognizes an individual “who has truly made a difference” – both in the forest products industry and in the community (Past Mulrooney Award Winners master list). In 1983, the recipient of this prestigious award was Louis Huettl, Sales Manager at The Pas Lumber Company (Winton Sales). I have learned that “Lou” was one of the early key industry people in the B.C. Interior. Well-loved and well-remembered by industry, he was a fierce supporter of wholesalers and the wholesale role in distribution. At the same time, he was also evidently one of the most outspoken skeptics of the lumber futures market! 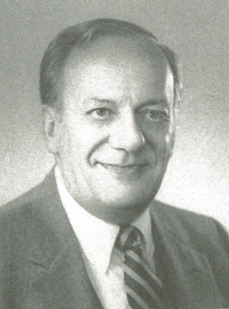 The same year Lou Huettl was honored by NAWLA, the B.C. Wholesale Lumber Association honored him with a special dinner at the Terminal City Club. With a nod to Lou’s Iowa roots, Ernie Harder (Col-Pac Lumber Company) paid tribute by parodying a song made famous by The Music Man. The live audio recording of “Trouble” from that evening can best be described as a classic. Retrieved from an old cassette tape and carefully restored, it is archived below. Listening to it now offers an indication of the passion, and early apprehension and misgivings that were expressed by Lou Huettl and many others who were skeptical of the value of the futures market in trading lumber at the time. This entry was posted in Industry and tagged BC Wholesale Lumber Association, BCWLA. Bookmark the permalink. Thank you for having this out here for us to hear. Lou was my Dad and I miss him so much. He has been gone for 17 years now. He was such a good man in every aspect of his life!! Hi Linda, thank you for your comment. New generations of the lumber wholesalers miss your Dad also. In the John J. Mulrooney Memorial Award, Lou will always be remembered as a giant of the industry.